Virgo. © 2003 Torsten Bronger. Virgo (abbreviation: Vir), the Virgin, is a very large constellation of the celestial equator and the sixth constellation of the zodiac. 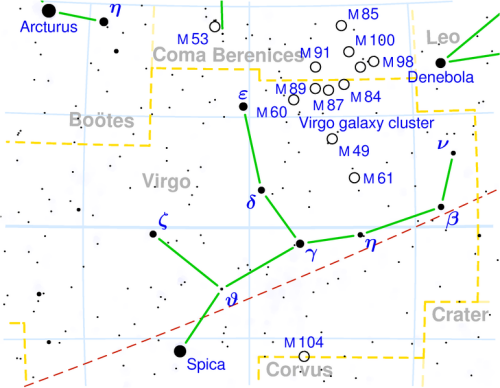 Virgo lies south of Coma Berenices and west of Libra, and is home to the Virgo Cluster of galaxies. See below for details of the constellation's brightest stars and interesting deep sky objects. Abbreviation: Vir; genitive: Virginis.